For more than 25 years Loran Speck has been regarded as one of the finest still life artists in the country, if not the world. His original oils, watercolor colors and charcoals have been compared to those of Rembrandt or Caravaggio. Ginger Jar is a fine example of his work. The detail of this tapestry is simply exquisite, from the marbled texture of the Ginger Jar to the fine embroidery of the Oriental silk cloth that covers the table. Speck misses nothing in his renditions, which explains why his work is so highly regarded in art collector circles. 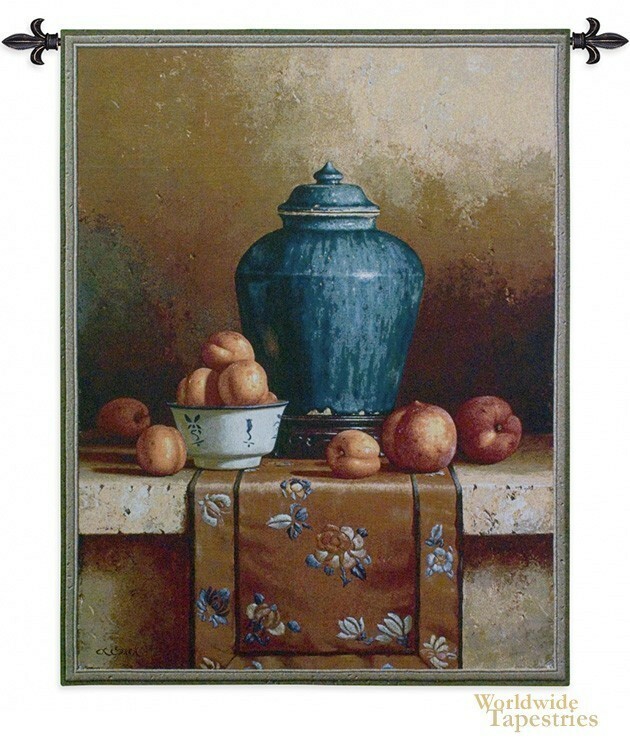 Ginger Jar, which is often known as Ginger Jar with Peaches, Apricots and Tapestry, is available with a rod tunnel so you can easily install this tapestry in your home. Note: tapestry rod and accessories, where pictured, are not included in the price. Dimensions: W 43" x H 54"